Looking for a cure for those bouts of afternoon drowsiness that assail you on working days? Have you been facing low energy levels? It’s time to pick up your game and your energy levels. Whether you are falling asleep at a moment’s notice or you simply want to rev you your energy, these are solutions that will work. Exercise provides energy. Starting the day with exercise provides compounded energy across the day. For those who cannot get up early, there’s always a lunch break for a quick walk, bike ride or jog depending on how much you want to sweat. If there is no time to spare, simple stretches can also circulate the blood and keep you awake. Stand up every 20 to 30 minutes. Replace the email or IM with an actual visit to your colleague’s office. You can even grab a glass of cold water to refresh you. Exercise helps you to not just stay alert when it counts, but also sleep better during the night. A meta-analytic review of 70 studies covering 6,800 people found exercise was more effective than medication in treating sleep issues, increasing energy and reducing daytime fatigue. Regular exercise also improves sleep quality. Exercising around 30 minutes per day is important. Energy levels may drop initially but surge for a few hours after that. Eating meals that are rich in carbs and protein post a couple of hours after a heavy workout lessens initial energy loss. Work must be finished a few hours before bedtime, so one is not left feeling energized while trying to sleep. Don’t opt for a doughnut or a cup of coffee while nibbling on something in the office. A wonderful midday snack with natural energy can be the perfect replacement for that third cup of coffee. Bananas are also a wonderful midday snack. As the natural sweetness and high fiber content take longer to metabolize than artificially flavored or processed items, it is a wonderful energizing snack. Peanut butter which is also jam-packed with protein is another great additive for a snack. Ultimately, protein bars are great for someone with the need to keep up energy levels. The protein bar should be around 100 to 200 calories. However, it should not be a replacement meal bar with lots of calories and sugar. If you choose a snack, make sure it a healthy one. Hydrating yourself is another positive action. It helps you to stay healthy and alert. Water offers limitless benefits when it comes to hydration. It also boosts energy levels by permitting the oxygen to flow to the brain and bodily organs. For an additional boost, ice cold water is a must. Your body gets 30 percent less oxygen if your posture over the desk is slumped. Next time you feel like slumping, work actively to realign yourself so that the chin is up and the shoulders are straight. Don’t be chained to a work desk. You need a change of scenery in an 8-hour workday and it is essential to keep energy levels up. Leaving the desk and enjoying lunch in pleasant surroundings such as a sunny park down the street, or over a few laughs offers a lot of benefits. If there are issues with staying awake and there are limited hours at your disposal, you need to compartmentalize your schedule. Break up the entire day into manageable time slots, around 20 minutes apiece. Each time slot needs to be worked on to achieve a certain task. Time goes by faster when it is divided into pieces. If slumping at noon is an occupational hazard for you, opt for pre-scheduling the days from the start to the finish. There needs to be dedicated time for specific tasks to ensure productivity and help the day to go by without excessive sleepiness or dragging. Trying to look at the clock every two minutes is a surefire way to waste your time. So is slumping and losing alertness during a workday. To beat this, you need to work with complete concentration so that the time ticking by can remain in the background. Organize your papers rather than just sitting in one place. Engaging in repetitive and monotonous activities helps time to tick by without noticing. Another great way to stay awake is to have a standing desk. If sitting the whole day zaps your energy, consider switching over to a standing desk. These desks lower chances of obesity, diabetes, and cardiovascular diseases. Additionally, it’s much harder to go to sleep while standing up. Focus on keeping your mental states positive. When tired or faced with flagging energy levels, you need to reorient your thoughts to focus on achievements or exciting projects to come. Another reason for keeping a positive outlook is that worry and stress are major causes of lethargy. It is essential to leave them behind. If worry and stress are unavoidable every day, restrict yourself to worrying for only a certain period of time and not letting it control your entire day. At the beginning of each week, plan out the essentials or long-term goals or even simple tasks you want to accomplish. While finding yourself sleepy, get these tasks done. Call up your pharmacy to refill a prescription or make an appointment with the dentist you have been putting off for some time now. Calorie-dense, processed and junk food are the biggest threat to your health and your levels of alertness. Eating heavy, large meals will spike your insulin and leave you feeling lethargic. Rather, aim for small meals rich in fiber and protein. Separate your food intake into small and manageable meals. In one study by Dr. Robert Thayer at California State University, people were given energy bars or a brisk 10-minute walk to see which would be more effective in raising energy levels. The candy bar provided a quick and instant energy boost. But within an hour, those who ate the bars were high on fatigue and low on energy. The 10-minute walk, on the other hand, increased energy for 2 hours. Walking leads to circulation and oxygen movement through the muscles, brain, and vein. If you’re stuck at a work desk, try walking for a short time. At meal breaks, go to a park or restaurant and take a breath of fresh air. Walking outside is bound to make you feel refreshed and alert. Sleep anywhere between 5 and 25 minutes a day. But don’t take more than one nap and don’t sleep too close to bedtime. Nap 6-7 hours before you hit the sack. Even if you want a late nap close to bedtime, make sure it is a short one. Napping at work can be tough. 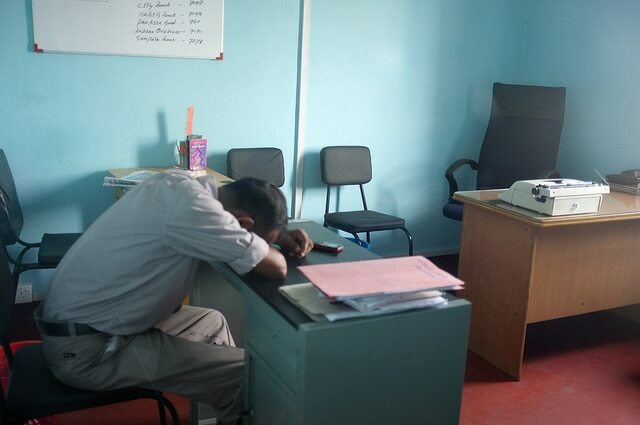 But companies do provide a leisure or nap room for employees. Even resting 10 minutes with your eyes closed can help. Constantly staring at the computer screen leads to eyestrain, besides triggering sleepiness and tiredness. Battle fatigue by taking your eyes off the screen for a few minutes to relax. Another great way to really wake yourself up from feeling lethargic and tired is to engage in conversation or let thoughts move in your mind. The subject could be a business idea, or even politics or religion. Conversations about such engrossing topics are bound to keep you alert and awake. Forwarding off fatigue, you need to avoid an environment with dim lighting. Research has shown that exposure to bright lights raise alertness levels and reduce grogginess. Try to increase the intensity of light sources at work. Deep breathing, meditation — these are just some of the ways to raise blood oxygen levels in the body. Additionally, taking time off lowers rate, blood pressure and improves the circulation. This aids energy levels and improves mental performance. Deep breathing exercises can be inhaled to the abdomen, not the chest. These can be tried out at the desk. Sitting up straight, exercise your lungs at the desk. With a single hand on the belly just below the ribs and the other on the chest, inhaling deeply through your nose and let the belly push the hands out. Your chest should remain stationary. Breathe through the lips too and use your hand to push belly air out. Another technique is known as stimulating breath. It is used in yoga for quick energy boosts and enhanced alertness. Inhaling and exhaling rapidly through the nose, the mouth should remain closed but relaxed. Take the breaths in and out short, completing three in a one-second cycle. Then breathe normally so you can try this for 15 seconds and add on 5 seconds thereafter for successive sessions. It was 2004 when Finnish researchers studied people working for 12-hour night shifts. 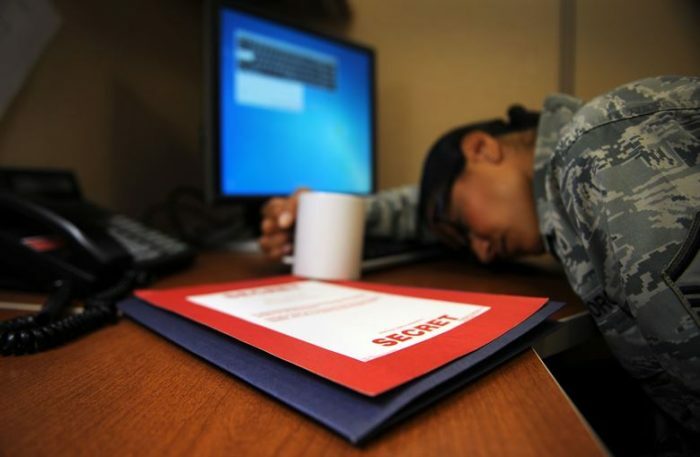 They found monotonous tasks tended to create the same effect as sleep deprivation for alertness levels. 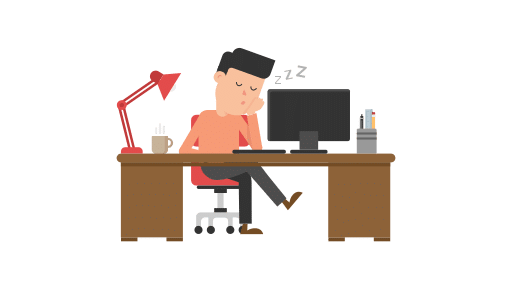 While routine tasks can relax you and lower stress, thereby warding off lethargy, it is also true that stimulating tasks for sleepy times or engaging work responsibilities while nodding off can be really beneficial. The circadian rhythms regulate the sleep-wake cycles. These are linked to daylight. If you spend a minimum of thirty minutes per day outside in natural sunlight. Sleep experts indicate that at least an hour of morning sunlight is a must if one has insomnia. Even stepping outside for fresh air revives the senses. There are many ways to stimulate your senses. You can ensure your eyes, nose, and ears are active and alert. There are different parts of the body which are alert, causing a person to be less likely to fall asleep or feel tired. Try turning on as many lights as possible or positioning yourself close to the light source. Chew on gum or take a mint to ensure your senses are focused. Sniffing peppermint oil is also essential for waking up the olfactory senses. If you want to ward off lethargy, another good way is to listen to music such as hip-hop,classical, rock, jazz and many more. When the eyes hurt, take some time out to look and observe a wall or outside a window. Alternately, you can also splash warm or cold water on the face. Meditation while staying awake and sitting for 15 minutes is also beneficial. Another way to stimulate the senses is to mobilize the body into feeling more alert. Take time to make the movements, press your earlobes, or rub hands together to keep alert, active and energized. You can even put hands in a fist and release them. This needs to be repeated around 10 times, and then tap the feet in a light way on the ground. Then, stretching the legs, arms, wrists or even rolling your shoulders should be next. Go outside and smell the fresh air or massage the hands. Another thing is that you need to stay active. To be active, you don’t need to run a marathon. Just some physical exercise can snap you awake. Boost and build activity levels whether you’re at college or work. Just a couple of minutes of exercise can impact how awake you feel. Exercising is one of the ways to stay active. Here are many others. Walk across the room or even the street. If you are at college, take a longer route to classes to stay active. Always use the stairs rather than elevators as this can help you for it keeps your heart rate moving and enables you to stay alert. Try 10-minute walks in a day. Make regular exercise a habit too. One of the most important ways to ensure you don’t lag behind is to eat plenty of food at breakfast. Try eggs, turkey, light toast, yogurt or even oatmeal. Add green veggies to your meal like kale, celery or spinach. If you want, you can even enjoy a nutritious, fiber-rich smoothie. Eating the correct type of foods can boost energy levels. It can also make you feel active and fuel your body for a couple of hours. Incorrect foods can continue making you feel bloated, sluggish and fatigued. Avoid consuming simple carbs and sugary foods. Don’t have large or excessive meals. Instead, eat regulated portions in a day and a light snack when you feel peckish in the day. Avoid starchy foods, heavy meals, fat-rich meals, and alcoholic beverages. Additionally, these can wear down your digestive tract. Never miss out on meals. In case you are tired and the mere thought of eating makes you fatigued, not eating is not the right way to ward off lethargy. Carrying a snack or foods rich in protein like almond and cashews can also wake you up and prevent you from choosing sugary treats. Additionally, you can also try caffeine to stay awake. If you tank up on it or guzzle it fast, however, a headache can result. The trick is to take a cup of coffee or green tea slowly. Dark chocolates can also boost caffeine levels. Watch out for energy drinks though. 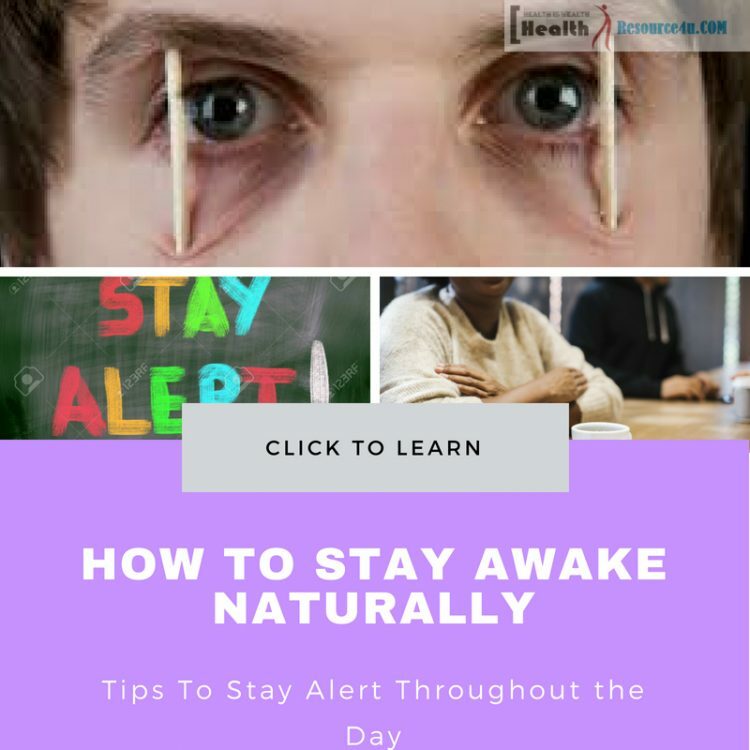 While these are great for momentarily waking you and boosting alertness levels, these can disturb your capacity to sleep and make you feel more exhausted the next day. Another important thing to do is to keep your mind from focusing off. To ensure the mind is engaged in thinking actively matters. If you’re attending a class, make it a point to pay attention. Everything needs to be written down and reread to stay alert. For those at work, interacting with colleagues about work-related tasks helps. 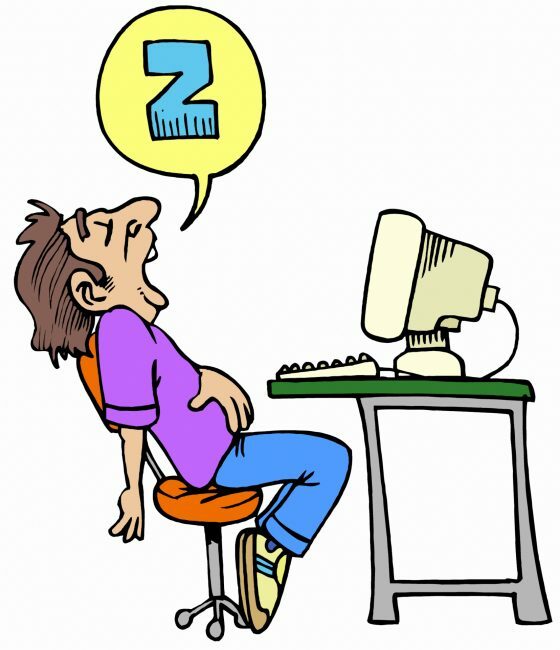 If one is desperately trying to stay awake even at home, chatting with a friend or writing an email is the way out. Keep yourself occupied. Make it a point to shift tasks as quickly as possible, and minimize distractions. Raise alertness levels as you take a walk before work. It works to stimulate the circulation in the body. Also, take a nap on the job before work to increase alertness levels. Sitting or standing for too long is likely to make you experience tiredness. Staying active can help people to stay alert and think with clarity. Get activity breaks every few hours. If you are working during the day, let in the sunlight. While working when it’s dim or dark, switch the lights on to stay awake and alert. Focusing on complex tasks can be hard when one is fatigued. Complete the easiest tasks when tired such as filing documents, organizing your workstation or replying to emails. Energy returns to normal levels as you complete the essential tasks. Keep oil diffuser or scented candles at the desk. Look for scents that are energizing and strong. Rub essential oils on the temples and the hands to keep one energized. Iron is a body mineral which is essential. It is an important component of hemoglobin and helps RBCs carry oxygen from the lungs to the rest of the body. Iron helps the daily brain function as well as the ability to fend off infections. The daily intake of iron for men is 8 mg and 18mg for women. You need to make sure you are getting 8 hours of sleep every day. Do not skimp on the sleep. Recent studies have shown those with six hours of sleep are as useful as those who don’t sleep at all! Lack of sleep leads to weight gain, stress, moodiness, irritability, increased risk of diabetes etc. Typically, one coffee cup causes an alert feeling for just 15 minutes while 8 hours of sleep make sure you are well rested. All in all, sleep is essential and so is stimulation. Boredom or monotony can trigger lethargy as well as disruptions in sleep. Even eating right and resting well can ensure there is no need for you to feel tired during the day. If you need to stay alert, caffeine may be a quick fix, but these tips can help the process forward.